Hidden Ridge Vineyard lies between Mount Hood and Diamond Mountain in the Mayacamas mountain range near Pride Mountain Winery and Paloma Vineyards. Elevations range from 900' – 1700'. 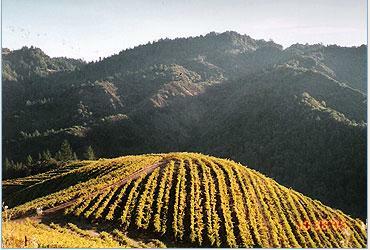 Surrounding mountain peaks rise to 2400' and shelter the 55 acre vineyard giving rise to its name – Hidden Ridge. The area has been faulted and uplifted over geologic time. Large smooth river rocks can be found high on the mountaintop. Three distinct areas: the ancient slide, the uplifted river bed and a volcanic cinder cone provide distinct growing conditions. Deep volcanic basalt and sandy clay loam soils support the 4 clones of cabernet sauvignon: 4, 337, 7 and 169. Because vines grow best on land that is naturally wooded, we planted the vineyard in areas where small oaks, manzanitas, madrone and bay trees had grown. Over 2/3 of the 160 acres remains undisturbed and is home for many species of plants and wildlife. Of the 18 different blocks, many are terraced with vines growing on the inside and outside of the terrace rows. Some blocks run up and down the hills. The modified VSP trellising system allows for some afternoon shading during the warm days. Late afternoon cool coastal winds bring fog into the valleys lowering the evening temperature. The ridge tops of the vineyard remain above the fog line. All together conditions for winegrowing are as good as they get.